If The Hummus Theory is a restaurant it would definitely be Azkadenya! لو نظرية الحمص صار مطعم أكيد رح يكون مطعم أزكدنيا! I just came from an EXTRAORDINARY feast in Azkadenya restaurant located near Ramallah's Cultural Palace. It has always been one of my favorite places in Ramallah, and I am glad I will finally give it justice with this post. هلا رجعت من وليمة غير عادية في مطعم أزكدنيا بموقعه بالقرب من قصر رام الله الثقافي. كان دائماً واحد من الأماكن المفضلة عندي في رام الله ومبسوطة أنه أخيراً رح أعطيه حقه على المدونة. In Azkadenya you enjoy fresh ingredients, purchased locally, and prepared daily from scratch by their team. Their dishes are fusions of nutrition, modernity, and authentic middle eastern flavor. في أزكدنيا بتستمتع بمكونات طازجة، محلية، ومحضرة من فريق ألمطعم. أطباقهم بتجمع التغذية، الحداثة، ونكهة الشرق الأوسط الأصيلة. So let the experience begin; before even starting, you'll fall inlove with Azkadenya's interior. Quotes from Egyptian movies, versus from Fayrouz's songs, and common phrases that will put a smile on your face. خلينا نبدأ هالتجربة؛ قبل أي شيء، رح تقعوا بحب التصميم الداخلي لأزكدنيا. مقولات من أفلام مصرية، أغاني فيروز، وأمثال معروفة رح تترك ابتسامة على وجهك. I was welcomed by the friendliest staff and manager, Hanna Dawani who hosted us through the whole feast. I was even luckier to be joined by the executive chef of Azkadenya who introduced us to all the dishes and ingredients. استقبلنا الطاقم والمدير حنا دواني بكرمه وحسن ضيافته ورافقنا طوال الوليمة. كنت محظوظة أنه الشيف كمان إنضملنا وعرفنا على الأطباق والمكونات. We kicked off our feast with fresh juices: orange juice and the AMAZING lemon mint juice with rose flavor. I have tried many lemon mint's, but I can confidently say this is the best I have ever had! The rose essence adds a unique flavor making it not-your-typical lemon mint juice. بدأنا الوليمة بعصائر طازجة: عصير البرتقال وعصير الليمون والنعنع مع نكهة الورد الخرافي! جربت ليمون ونعنع كتير، بس بثقة بآكد أنه هاد أزكى ليمون ونعنع بجربه! مستخلص الورد يضيف نكهة مميزة ليصير ليمون ونعنع غير إعتيادي. While I would be satisfied ordering every dish on the menu, we started with a variety of small dishes. مع أنه ممكن أطلب كل طبق على المنيو، بدأنا بتشكلية أطباق صغيرة. Even before eating, you'll LOVE the little message on plates, napkins, and on food. 'Waiting your call' on napkins is my favorite! قبل ما تبدأ الأكل، رح تنبسط على الرسائل الصغيرة على الصحون، المناديل، والأكل. "بستنا تلقونك" على المناديل المفضلة عندي! Hummus (OFCOURSE) but not any hummus; pomegranate hummus with sumac- not only a vibrant color but a flavor that contrasts the creaminess of this tahini-based deliciousness. We also had to try the traditional hummus; if the original hummus is perfect then everything else is perfect. حمص (أكيد) بس مش أي حمص؛ حمص الرمان مع السماق- مش بس لون حيوي ونكهات كلها حياة من جانب ونعومة الطحينة من جهة تانية، جربنا كمان الحمص التقليدي؛ إزا الحمص التقليدي ممتاز يعني كل شيء مثالي. It's all about the dips in our Levant cuisine, so Hanna recommended the famous muhammara and one of their new items the beetroot muttabal. مطبخ بلاد الشام كله غموسات، وحنا نصحنا بالمحمرة وواحد من أطباقهم الجديدة متبل البنجر. For all the beetroot lovers (and non-lovers), this tahini and walnut dip is the next hit. Can you even resist this out-of-this-world color? The muhammara; this walnut-based dip was definitely my favorite. Trying it before by Lebanese chefs, Azkadenya killed it with their feta cheese addition! You'll go NUTS for this one. المحمرة؛ الغموس المحضر بالجوز هو المفضل إلي. مع أنه جربته من شيفات لبنانيين، أزكدنيا تفوقوا عليهم بإضافة جبنة الفيتا! رح تنجنوا عليه. All those dips are enjoyed with a fresh basket of pita bread prepared in house. Believe me, you'll need seconds of this basket! كل هالغموسات مع سلة خبز سخن يخبز في المطعم. صدقوني، رح تحتاجوا أكتر من سلة! After many recommendations, we went with the Date salad; fresh greens, red onions, dates, walnuts, and feta cheese complemented with a pomegranate molasses, balsamic, & olive oil dressing. Few ingredients, unique textures, and a symphony of perfect flavors! بعد توصيات كتيرة، إخترنا سلطة التمر؛ خضار ورقية، بصل أحمر، تمر، جوز، وجبنة الفيتا ومعها تتبيلة بدبس الرمان، البلسميك، وزيت الزيتون. مكونات معدودة وسمفونية من النكهات المتناغمة! This Levant mezzeh is not done right without falafel and obviously Azkadenya's falafel is no ordinary falafel. Besides the unique falafel mix (which has arugula-INTERESTING), the sampler had sundried tomato and kashkaval-filled falafel. All covered with sesame seeds, whether filled or not, this is one of the best falafel in town (trust the hummus expert). مازة بلاد الشام ما بتكمل بدون الفلافل وأكيد فلافل أزكدنيا مش أي فلافل. بالإضافة لعجينة الفلافل المميزة (إلي فيها جرجير- مثير للاهتمام)، الطبق فيه فلافل محشي بالبندورة المجففة أو جبنة الكشكوان. مغطى بالسمسم، محشي أو لا، هاد من أزكى الفلافل في البلد (كلمة مختصة الحمص موثوقة). I was already full with this amazing mezzeh, but we had to try the Freekeh Risotto Fukhara- Azkadenya style. I had freekeh risottos prepared with alfredo sauce and parmesan cheese. While the Italian twist was interesting, Azkadenya nailed freekeh risotto, Levant way! شبعت من المازة الرائعة، بس كان لازم نجرب فخارة الفريكة ريزوتو- بطريقة أزكدنيا. أنا جربت قبل الفريكة ريزوتو مع الألفريدو وجبنة البارميزان. هاللمسة الإيطالية كانت فكرة جديدة، بس أزكدنيا عندهم الفريكة ريزوتو الصح بطريقة بلاد الشام! Freekeh- perfectly cooked with a pungent, green color. الفريكة- مطبوخة بطريقة رائعة ومحافظة على لونها الأخضر الجميل. Yogurt-garlic sauce- amazingly prepared with dried mint over the freekeh and some more on the side for sauce lovers. صلصة اللبن بالثوم- محضرة مع النعنع الناشف وفوق الفريكة مع زيادة على الجنب لمحبي الصلصة! Chicken-Lightly grilled making it a full dish finished with fresh parsley and pine nuts. الدجاج- مشوي ليصير الطبق وجبة كاملة مع رشة بقدونس والصنوبر. I thought that was it but the sun was setting which meant dessert time. كنت مفكرة هاد أخر طبق، بس الشمس بدأت تغيب وصار وقت التحلاية. Azkadenya is known for their Umm Ali but their Icecream Ossmalyeh is what I really wanted to try. Hanna generously shared it with us and a cup of mint tea. أزكدنيا معروف بأم علي بس أنا كنت حابة أجرب عصملية البوظة وحنا شاركها معنا مع كاسة شاي بنعنع. I'm not a dessert fan, and I'm not the biggest arabic sweets fan, but this Icecream Ossmalyeh was a taste of heaven. 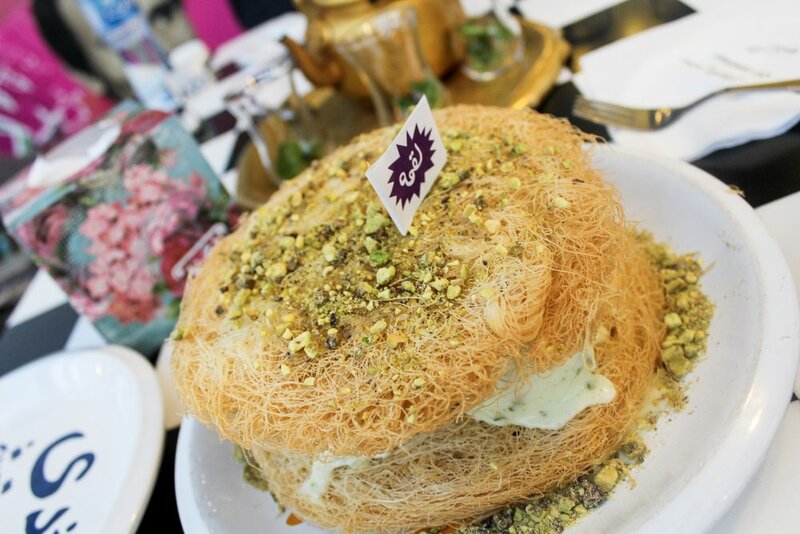 Arabic, pistachio icecream sandwiched with two light and crunchy kunaffeh layers; a fiesta of textures with perfect sweetness and authentic flavor. We finished it right! أنا مش من محبين الحلويات ولا من محبين الحلويات العربية، بس عصملية البوظة كانت لقمة من الجنة. بوظة عربية بالفستق الحلبي ما بين طبقتين من الكنافة المقرمشة؛ حفلة ما بين القرمشة والنعومة مع الحلاوة المثالية والنكهة العربية الأصلية. ختامها مسك! The menu still has tons to try; if that's not enough, Azkadenya offers Mansaf and Kabseh meals and will soon be launching a new menu with Wara'a Enab and Koussa (can't wait!). What I love about their menu is that it is based on customers' feedback and preferences. المنيو لسا في كتير ليتجرب، أزكدنيا بقدموا منسف وكبسة ورح يقدموا منيو جديد قريباً فيها ورق عنب وكوسا (متحمسة!). والحلو بالمنيو إنها بتعتمد على ملاحظات الزبائن وإختياراتهم. As if I needed another reason to love Azkadenya, they have the PalEat app to order their food (and Lemon's-a sister franchise) and get it delivered when you're too lazy to go and enjoy the Azkadenya experience. وكأنوا محتاجة كمان سبب لأحب أزكدنيا، عندهم تطبيق (بال ايت) لتطلبوا أكلهم (أو من ليمون-مطعم شقيق لأزكدنيا) ويوصلكم لما الكسل يمنعكم ترحوا تستمتعوا بتجربة أزكدنيا. On this experience, I took one of the toughest, pickiest judges: my dear mom. She savoured every bite, finished all her Ossmalyeh piece, and left so full she could barely walk. I guess it's clear how good the food is? Azkadenya Ramallah: for childhood-reminiscent atmosphere, best lemon-mint in town, and next-level freekeh. Next time your craving a homemade mansaf, the perfect mezzeh spread, or out-of-this world arabic desserts, Azkadenya is your saver. أزكدنيا رام الله- جو كله ذكريات، أزكى ليمون ونعنع في البلد، وفريكة غير شكل. المرة الجاي بتشتهوا منسف البيت، أطباق مازة عربية مميزة، أو حلويات عربية غير إعتيادية، أزكدنيا رح ينقذك.